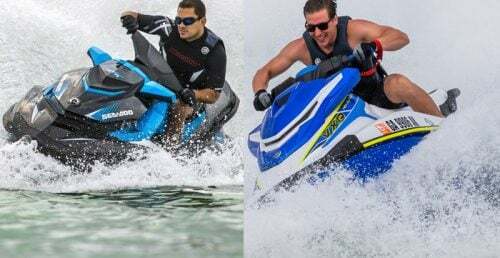 The 2019 Sea-Doo GTR 230 and Yamaha VXR share a similar target audience – performance-hungry buyers who don’t care for flagship model price tags…or their bevy of potentially frivolous extra features. As such, these two craft get right down to business, foregoing the pricey add-ons to focus directly on the task at hand – lightweight hulls mixed with powerful engines satisfying their buyers with good old-fashioned power-to-weight ratio. Here’s how the two craft compare in a direct head-to-head matchup. Stowage Capacity 30.7 gal. 24.6 gal. 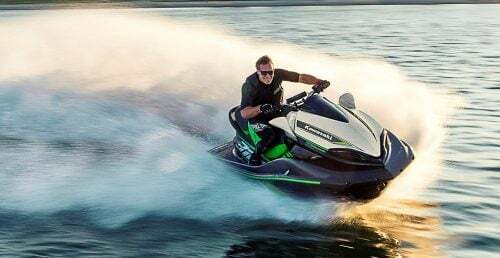 The 2019 Sea-Doo GTR 230 is powered by the Rotax 1500 HO ACE, a 1,494cc engine that adds a maintenance-free supercharger and external intercooler to extract more of its potential. Acceleration is aggressive out of the hole; top speed typically falls in the neighborhood of 65 – 67 mph in good conditions. Yamaha foregoes the supercharger and intercooler on the 2019 VXR, building its power with displacement. The familiar 1,812cc engine is the largest in the industry by a healthy margin. Grab a handful of throttle and the craft similarly jumps onto plane before settling in at about 63 mph on average. 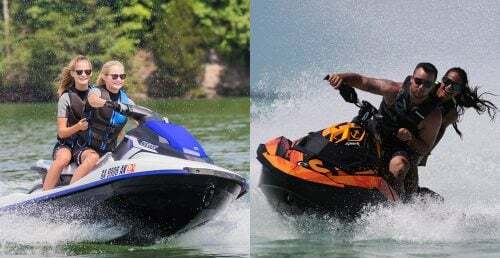 If there is a defined difference between the two craft, it’s in terms of handling, specifically their personality when aggressively cornering or attempting to simply freeride. 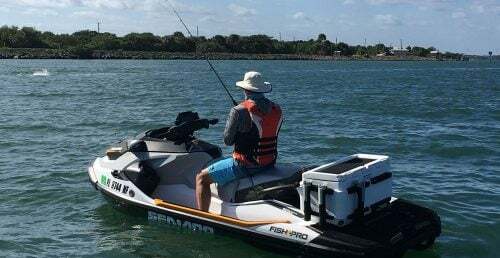 The 2019 Yamaha VXR has the feel of a stripped-to-the-essentials race boat, rolling into turns with an intuitive inside lean and aggressively powering through those corners with a precision feel. Drop the trim angle heading in, raise it upon exiting and you’ll feel every bit the racer. Meanwhile, Yamaha retains its classic prowess in rough water, powering through the waves without any surprises and holding its line. Upgrades for the 2019 model year include a “race-inspired” top-loader intake grate and rideplate. Sea-Doo takes a slightly different approach. The hull of the 2019 Sea-Doo GTR 230 remains classic GTI, with a shallow deadrise and overall looser feel. Yes, aggressive turns are possible with the right weight shifting and trim position, but it’s not the racy feel of the Yamaha. On the flip side, however, those who want a more playful craft will note that same judicious use of weight shifts and trim can result in a craft that you can spin or slide like craft of old. Both craft follow their respective family lineage in terms of styling and ergonomics. The GTR is of the “pre-2018” GT styling, meaning it has not switched to the low-slung design that characterizes current flagships. The saddle is notably bolstered twice, once for driver and once for aft-most passenger, and tiered to position the passenger higher than the driver for a more comfortable riding experience. Yamaha likewise tiers the saddle and gives the driver a substantial bolster to lock in place, as well as provide welcome lower back support, but foregoes a second bolster at the saddle’s aft end, a possible nod to towing with a rear-facing spotter. A textured saddle surface and Hydro-Turf mats combine to offer exceptional traction. Neither craft features user-adjustable angles for the handlebars, opting instead for a fixed position. As mentioned, both craft forego extras to focus on the performance. Neither features cruise control or no-wake mode, but each wisely retains electronic trim. 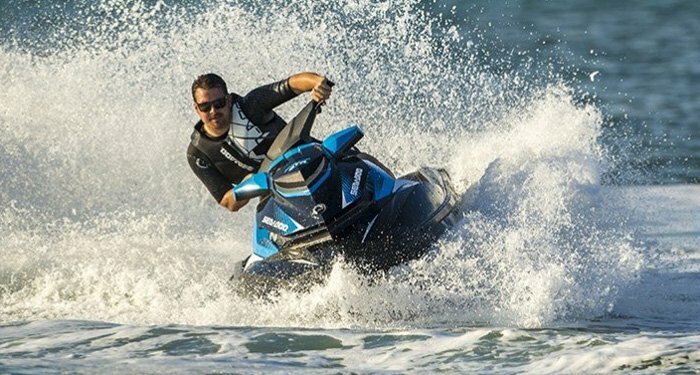 The 2019 Sea-Doo GTR 230 retains a choice of Sport or ECO modes, giving the option of full performance or a fuel-saving, lower-performance alternative. 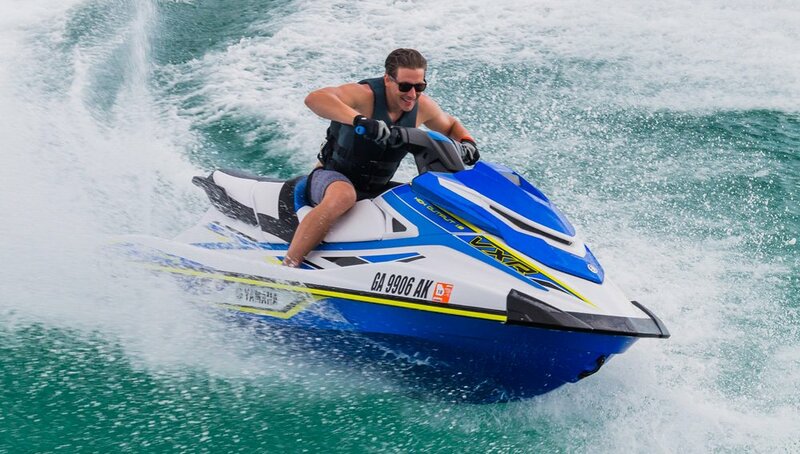 Meanwhile, the 2019 Yamaha VXR allows riders to put the craft into an eco-friendly mode via the remote security transmitter. Perhaps the best feature offered on both craft is each manufacturer’s version of electronic reverse and deceleration control. Both craft allow precise low-speed maneuvering by precisely controlling the angle of the reverse bucket to allow the craft to more closely mimic a boat’s forward, neutral and reverse settings. Sea-Doo literally mimics gears with the forward, neutral and reverse settings of Intelligent Brake & Reverse. Yamaha takes a more fluid approach with RiDE, making the left hand lever a throttle of its own to affect movement forward and back and apply power without hesitation. Both also provide strong deceleration (Sea-Doo calls it a brake, Yamaha does not) when the left hand lever is applied at speed, redirecting thrust to provide stopping power. In terms of size, the two are nearly identical save for a 40-pound weight difference. 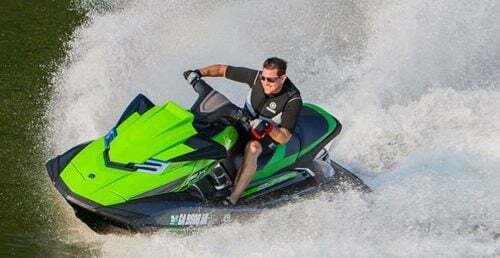 The 2019 Sea-Doo GTR measures in at 132.6” in length, 48.5” in width and weighs 807 pounds. Comparatively, the 2019 Yamaha VXR stretches the tape to 132” in length, 48” in width and 767 pounds. Price also finishes in a close heat. The GTR runs $12,199, the VXR $12,299. Obviously, this is a close comparison in many ways. Simple brand loyalty will make up many buyer’s minds. Looks, colors and graphics also will hold sway. The Sea-Doo is slightly more modern, the Yamaha more traditional in styling. The true differentiator between the two craft is handling personality. The 2019 Yamaha VXR is slightly slower in terms of sheer speed but much more race-inspired and locked-in through aggressive turns. 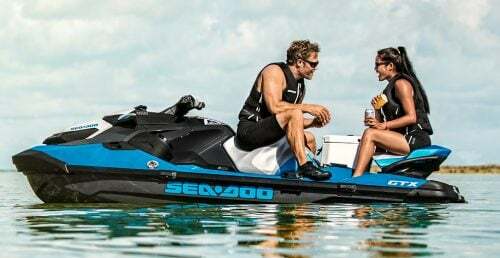 Meanwhile the 2019 Sea-Doo GTR 230 holds the slight top speed advantage but mixes it with a looser, more playful hull design. If possible, test ride both…we’d wager you’ll find a clear favorite.